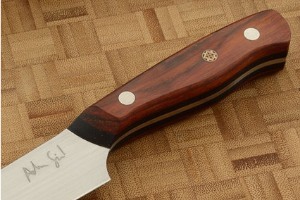 Description: This exceptional utility/slicer was made by Adam Sigal (Station Knives) in Portland, OR. Adam calls this shape the David. It was co-designed with Bombay Sapphire’s Most Imaginative Bartender 2012 – Nathan Gerdes. At 5 inches, this knife is built to be a bartender’s best friend. In the kitchen, it makes for an amazing petty knife. 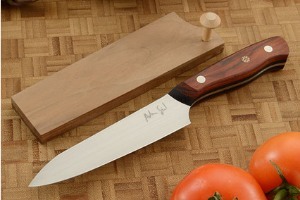 The low swell on the handle is perfect for choking up on the knife and creating garnishes. Beautiful cocobolo scales are set on black G10 spacers -- adding dynamic contrast! A central mosaic pin and two sturdy Corby rivets lock the handle in place. 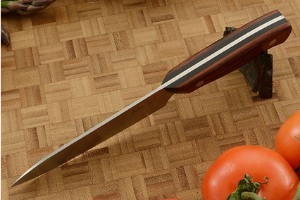 The knife is accompanied by a handmade walnut saya. 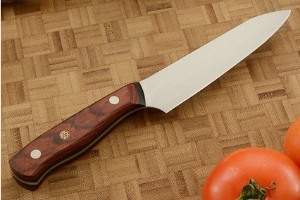 Excellent fit and finish on a tremendous handmade chef's utility knife. This knife will be a perfect choice for either a home or professional chef. 0.032012939453125 0.032012939453125 32.012939453125 32.012939453125 Header Started. 0.125 0.045989990234375 125 45.989990234375 Trailer Started. 0.2349853515625 0.1099853515625 234.9853515625 109.9853515625 Trailer Completed.